UG to FC from X on ATL to YYZ for 8,900 (I thought it was a good enough deal, and I'm GM now...). But, then there is the YYZ-CVG-LAX. NO FC on YYZ-CVG seat 1A is C+, but WOW on the CVG-LAX. The flight is on April 1st, is it possibly an April Fools joke? 11 of 16 seats still available. I honestly believe that, if there is any logic at all, it is to get people to burn miles. I just received a domestic first-class buy-up offer for Minneapolis–Detroit on a 757. $181.68 or 16,900 miles. All that said, Wednesday's likely to be a mess at SFO, there's no current weather waiver, and I'm guessing I will miss DTW-GRU anyway with my tight connection. On the other hand, if you did the buy-up then Delta might be more generous in rerouting you as a paid first-class or business-class passenger or even booking you on another airline. Considering an offer of $181 or 16,900 SkyMiles for SFO - MSP since it is an early AM flight and I could maybe get some rest and get a few extra MQMs, but still a little steep for a 3.5hr flight. What is typically considered a “good value”? Value is always subjective. Is $181 what you spend on drinks after work or what you need to bring your mortgage current? If the former, the UG is worth it. If the latter, probably not. Fair enough - mostly looking for a reasonable target on something being a decent deal or not. Thanks! I just received a buy-up offer of $136.68 or 12,900 miles for domestic first-class on a MD-88 between Panama City/Northwest Florida Beaches (ECP) and Atlanta. This flight is blocked at about 1-hour. There are 11 open first-class seats. Such a bargain to bundle First. Taking after cable and wireless companies I guess... Really hard to pass up. $74.18 or 6,900 miles for Chicago O'Hare ORD–Detroit DTW on an A320. As a reminder, this flight is about 1-hour in duration. 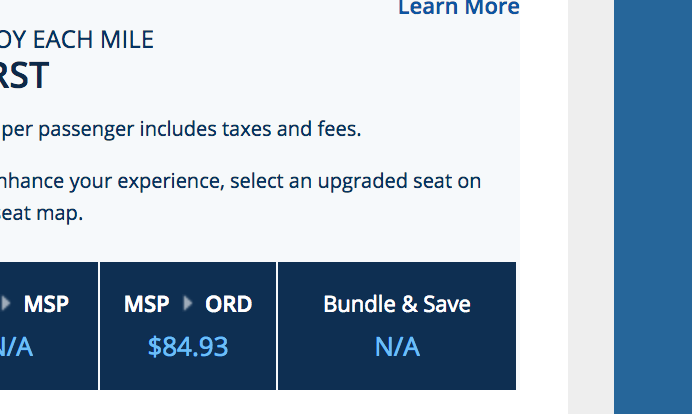 Meanwhile, Minneapolis to ORD has a buy-up offer of $84.93 or 7,900 miles for first-class on a 717. Again, the flight is about 1-hour and change. I'm confused here. Isn't this a buy-up offer to only Comfort + and not to first. It seems to offer "Sky Priority" boarding and not "Premium"
No, it's first-class. I'm already in second-class, aka comfort-plus.